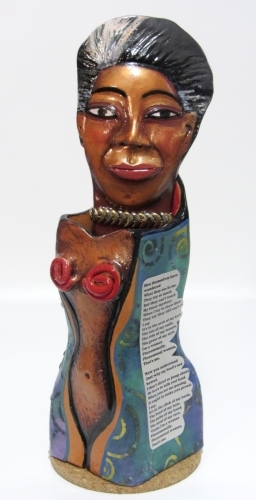 Maya Angelou's "Phenomenal Woman" poem is printed in either side of this clay sculpture. Shipping and handling charges are additional. This lady, KaKenya, has a powerful dream. You can see it in her eyes. 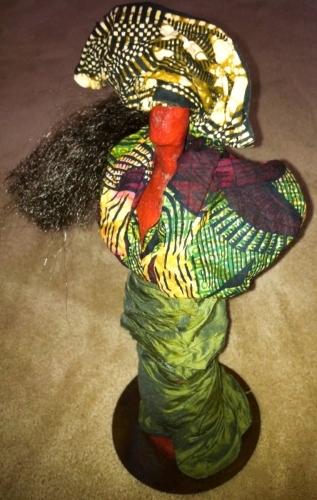 Wrapped in an African fabric head wrap and mud cloh scarf, she exhibits a strong sense of nia (purpose). Her beaded earrings and necklace were created by Maasai tribespeople. Shipping and handling charges are additional. 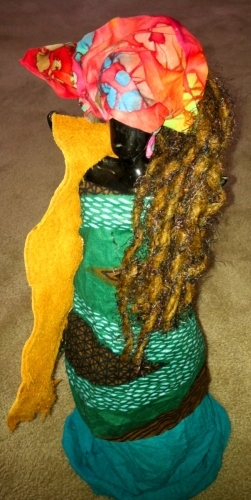 “New Age Ankh” is headed by an African Ankh, which represents fertility. 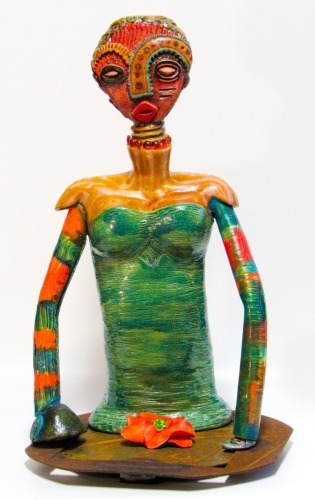 The shoulders and chest are variegated with Mocha and Copper Adventurine glazes fired to cone 1. The nubile, coil-built torso and extruded arms lean forward on a steel platform, as if to take in the whole universe. Shipping and handling charges are additional. Kanika hand-sculpts each figurine body from a lump of red clay, fires it in a kiln to at least 1900 degrees, paints on a color glaze for the skin tone, fires it again, then adorns the piece with hair, fabric, leather, and/or beads. This sassy young Yoruba woman is assembling her elaborate glass beads in preparation for a special festival. She arches her back in excitement, a precursor to the traditional dance she will confidently execute at dusk with the other women of the tribe. 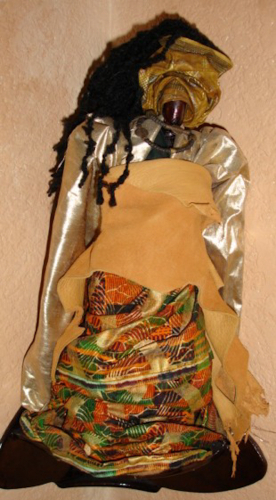 This piece is hand-sculpted from clay and draped in authentic African fabric and different types of glass and trade beads. Won Award of Merit at 2002 California State Fair and Sacramento Fine Arts Center. Shipping and handling charges are additional. 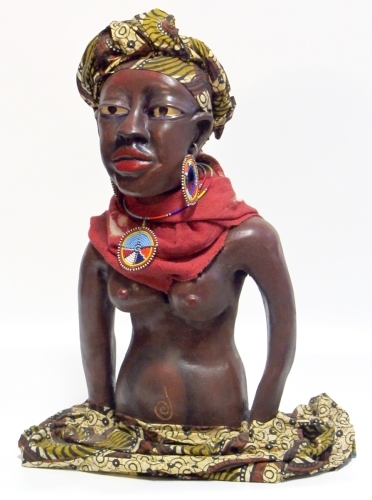 Kanika hand-sculpts each figurine body from a lump of red clay, fires it in a kiln to about 1900 degrees, paints on a color glaze for the skin tone, fires it again, then adorns the piece with hair, authentic African fabric, leather, and/or beads. “Queen Charlotte” was inspired by United Kingdom’s Queen Charlotte, who was reputed by some to have African blood. 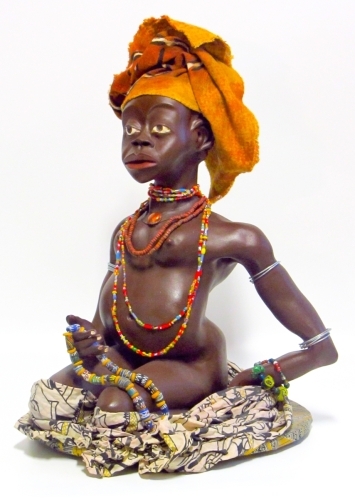 The Victorianesque bodice is extensively carved with positive affirmations and detailed tribal textures on Sculpture-Raku clay fired to cone 1. 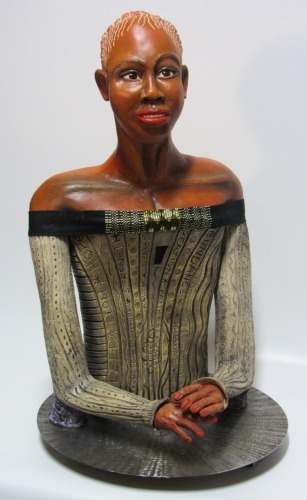 Black iron oxide was rubbed into the etchings and layers of acrylic paint and stains were used for the skin tones. 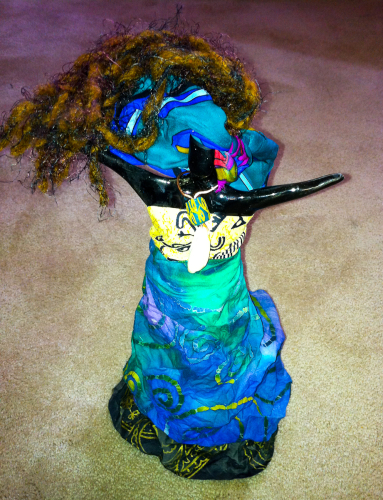 YES, THIS IS THE 1000th FIGURINE THAT KANIKA MADE SINCE 1994! Kanika hand-sculpts each figurine body from a lump of red clay, fires it in a kiln to at least 1900 degrees, paints on a color glaze for the skin tone, fires it again, then adorns the piece with hair, fabric, leather, and/or beads. 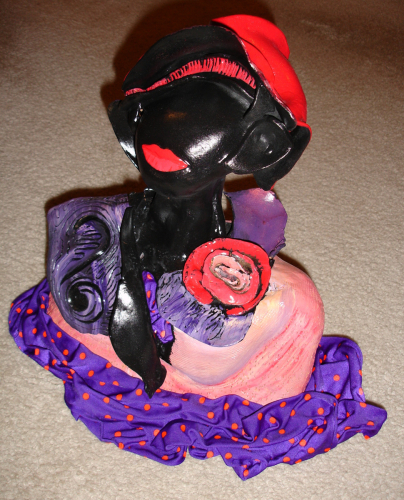 Black-skinned bust sports a jaunty red and purple hat, purple boa, and lacy neckline around her mastectomy. Saucy beauty! Shipping and handling charges are additional.